Sixty mini kimchee biscuits simply disappeared, but it didn’t make it to the evening news. Although I sold a lot of my Hanguk Saffron at the artisanal food bazaar this past Sunday, the kimchee biscuits were the star at my tasting table. Gallery owners Bill Walsh and Joe Sera (at The Outside in Gallery) proudly produced The Outside in Piermont Artisanal Food Bazaar, a unique market for small batch and artisanal food and beverages. The Outside In is a gallery and an incubator for artists looking to develop their portfolio and for those who collect outsider art. 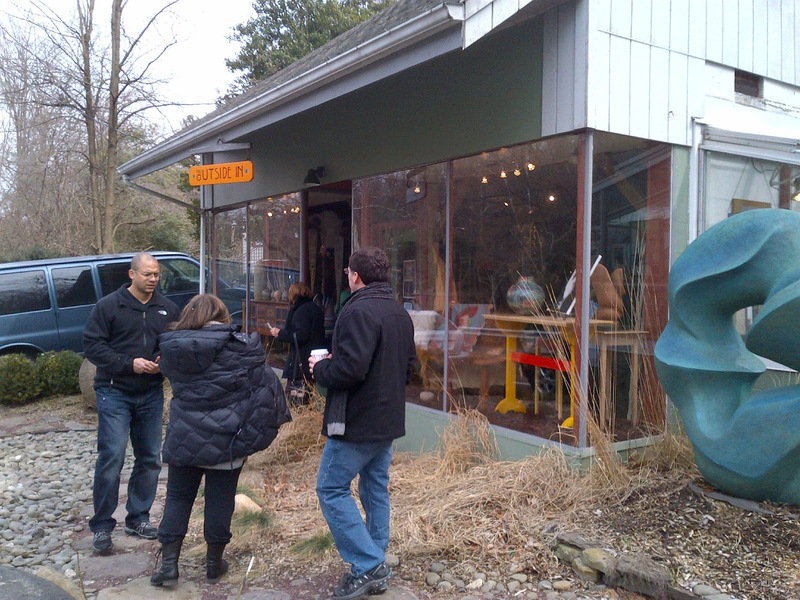 The building is a handsome former florist shop with two green houses where creativity is nurtured and grown. Once the doors opened at 10AM people hungry for a taste of hand-crafted foods rushed in. 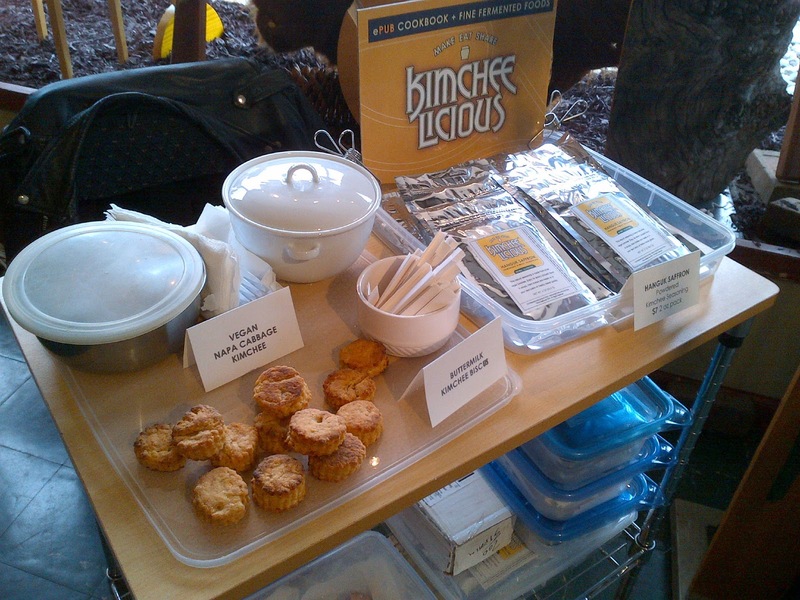 Kimcheelicious was one of the 18 vendors there on March 17, 2013. I met new folks, and got reacquainted with some old freinds, but mostly I got to meet some of my Facebook friends in person—two very funny and talented ladies Nata Traub (Nata Traub Catering) and Tamika (Humble Pie). Nata made her signature “Bottoms Up Punch” and Tamika baked savory and sweet gluten free goods. I caught a ride with my friend Alex Crossier (Granola Lab), she makes the most delicious small batch granola and grain energy bars right here in Brooklyn. We got a little lost getting there, but the Hudson Valley must be the charming place to wander. There were a few Brooklyn-based vendors aside from us. Vegan, organic and gluten free are the new keywords in the artisanal food lexicon. I’m not a vegan, but my kimchee is. I fermented a batch of medium-heat vegan Napa cabbage kimchee for my tasting table. I’m always surprised how many people don’t know that true kimchee involves an animal product, usually shrimp or fish sauce (oops, sorry city vegans). I created a method that involves mycoprotein, an amino acid found in mushrooms and crustaceans. How good was it? A fourteen year-old boy and his friends ate most of the kimchee samples... I can’t believe I got kids to eat vegetables. It was a busy day on the floor, I didn’t get to meet most of the other vendors. I just saw a sea of roving heads and hands but I had a great view of the Sparkill Creek from my kiosk. I had a brief reunion with my friends Nisa and Dave. I even ran into an old college classmate Paula. Nisa had to give her a reminder from back in the day: “Worked at the Tool Crib... sloppy mohawk... lots of black eyeliner and earrings...” “Oh that guy!” Now that I’m older I sport the no-hawk. Male baldness pattern happens. Vendors came from all over—from Kings County and up the Hudson. We all sold well to a hungry crowd. I created a lot interest in my ePUB cookbook and found new fans of my Hanguk Saffron who follow my blog. I met some restauranteurs and food foragers, and I made great contacts for future batches of Kimcheelicious Foods. By request I’m selling my vegan kimchee by the pound at the next event. 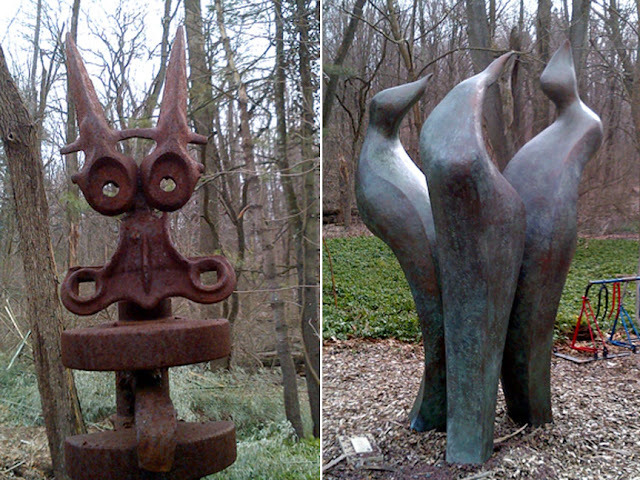 A spectacular sculpture garden surrounds the campus with whimsical and art. A toast to all the tastemakers and the town of Piermont NY: Anarchy in a Jar, Balthazar Bakery, Center For Safety & Change, Granola Lab, Growler & Gill, Gypsy Donut, Heat Sweets, Honeybrook Farms, Humbled Pie gf Bake House, Kimcheelicious, Kontoulis Family Olive Oils, Maura’s Kitchen, Mimi’s Plate, Nata’s Cocktails, Plowshares Coffee, Sprout Creek Farms, Wild Hive Farm, Your Spice of Life and mostly a special thanks to Bill Wlash and Joe Sera for putting this incredible event together.